Albrecht Dürer (1471-1528) was the greatest German artist of the Renaissance. He excelled as a painter and print maker with his precise attention to detail and an ability to infuse his works with life. The sketches here are but two among many character studies that never left his sketchbook, but they are remarkable because they were based on actual encounters with people of African descent in Central Europe, rather than being the product of Dürer’s imaginings. They reflect the artist’s great interest in the new people and goods moving through Europe as a consequence of growing international commerce. As such they also give us an insight into the growing presence of Blacks in Renaissance Europe, many of whom came as a consequence of increasing trade contacts with sub-Saharan Africa, which of course included the slave trade. 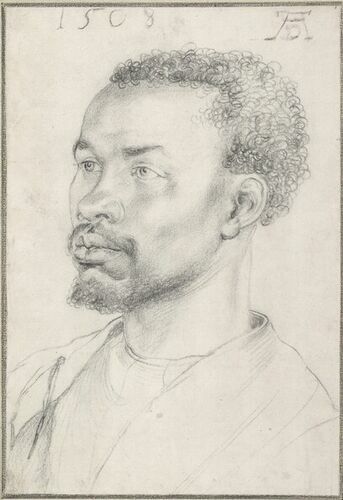 The “African” man sketched is anonymous, which was not unusual for such character studies. Perhaps Dürer had seen him on his travels in Italy a year before, or perhaps the artist encountered him in his hometown of Nuremberg, which was an important trading and political center. Most likely the man was a slave, a free servant, or otherwise a member of a noble retinue given that his dress indicates a lower social standing. We know the woman in the second sketch as Katharina, a 20-year old servant of the Portuguese factor João Brandão, who housed Dürer when the artist visited Antwerp in 1521. Although we know nothing more, we can guess that Brandão acquired her through his trade dealings (he was in charge of the Portuguese spice monopoly in Antwerp) and, given her name, that she had converted to Christianity. In these pieces Dürer humanizes his subjects. He does not reduce them to caricatures but rather testifies to their individuality and dignity. 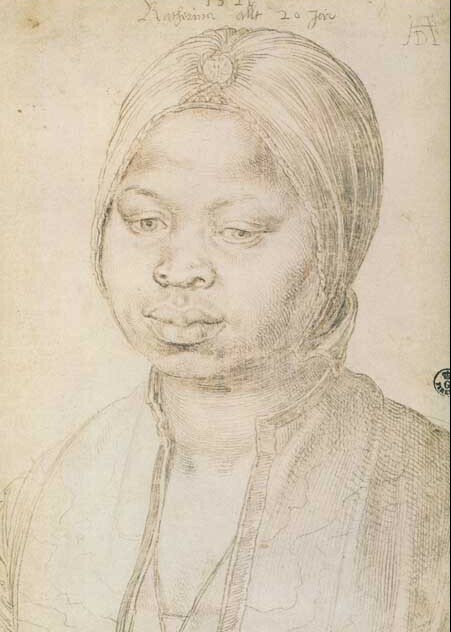 Sources: Albrecht Dürer, Portrait of an African (1508), Grafische Sammlung Albertina, Vienna; Portrait of Katharina (1521), Galleria degli Uffiyi, Florence. Albrecht Dürer’s sketches (1508, 1521) by Jeff Bowersox is licensed under a Creative Commons Attribution-ShareAlike 4.0 International License.